Students and teachers, we need your input as we build CISL tools to make sure they meet your needs! You will act as partners in the design process by experimenting with features and contributing your opinions. Our aim is to design tools that provide students with and without disabilities access to engaging, high-quality digital learning materials, and to do that we need to hear from you. 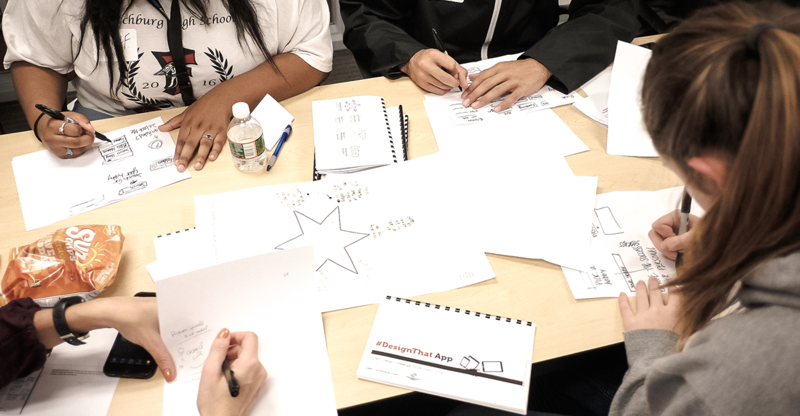 Students participate in a paper and sketching design exercise where participants sketch eight distinct ideas on paper in eight minutes. Four people gathered around a table writing on indiviudal pieces of paper. There is a piece of paper with a star in the middle of the table. Students will get first-hand experience being part of a software design and development team. The time commitment for co-designers may be in the range of 1-4 hours a month. In order to meet the needs of a wide range of learners, we hope to recruit a group of co-design partners that reflect the diversity of the country’s students and teachers. We anticipate that CISL users will vary in respect to ability, gender, race, comfort with technology, primary language, and many other factors. We welcome these differences in the design of our tools. Want to create with us? We need student and teacher volunteers to co-design products now, and to act as beta-testers once tools have been developed. Please fill out the CISL Partners Inquiry Form to let us know how you’d like to be involved. Email Mia Redovan at mredovan@cast.org with inquiries. This content was developed under a grant from the US Department of Education, #H327A170002. However, the contents do not necessarily represent the policy of the US Department of Education, and you should not assume endorsement by the Federal Government. Project Officer, Tara Courchaine, Ed.D. Except where otherwise noted, the CISL website content is licensed under a Creative Commons Attribution 4.0 International License.